Neti pots are a tool to respond to dust irritation in the nasal passages. In Seattle, an individual using water in their neti pot caused a fatal infection. What's sterile technique? Boil the water first? I've been using distilled water and saline packets for 6-7 years. - water boiled for ten minutes, then cooled. Never tap water (nor spring water, nor lake water, etc.). The saline should stop it from stinging, and should kill some things (breaks down the cell walls?). The deceased used tap water, which turned out had a trace amount of amoebas. So her brain ended up infected with amoebas. I used sterile technique at one time in a lab job. We had UV light-flooded rooms you could not be in with the lights on, negative pressure and iodine wiping everywhere. Playa dust is a microbial stew. Frankly I think sterile technique is impossible on the playa. Maybe there is a single use saline bag which could be used to reduce the risk. 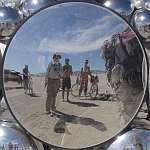 People use neti pots on the playa and haven't died yet as far as we know, but the risk can't be denied. So consult your health care professional! There are indeed single-use nasal washes in pharmacies. Probably the best choice for unclean environments. Having read about what happened to that poor woman, I'm suitably chastened about my casual behaviors with tap water in the past, and will never, ever do that again . . . I'm holding out for the Naväge Turbo Deluxe Nasal Sucker and Lung Remover. Thanks! ePlaya has a lot of useful information!